Rejuvenate, nourish & recharge skin. Anti-age night innovation. 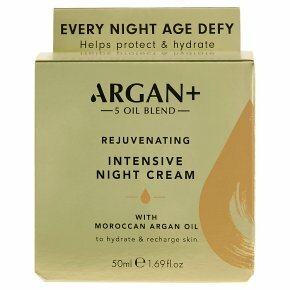 With argan stem cell complex.Argan+ Skincare blends precious Moroccan Argan Oil with wonder oils and effective anti-ageing ingredients to deliverbeautiful results. With regular use, skin is left feeling hydrated, revealing a fresher and younger looking complexion. Argan+ Synergy is an all-natural 100% blend of precious Moroccan Argan Oil and 4 other amazing oils: Baobab, Kukui, Moringa and Sacha Inchi, all selected for their restorative, regenerating and nourishing properties. Argan Oil With Vitamin E, Carotene (Antioxidants) and Omega 6 and 9. Baobab Oil Vitamins A, D, E and F as well as Omega 3, 6 and 9. Kukui Seed Oil Rich in Linoleic and Linolenic Acid (essential fatty acids). Moringa Oil Rich in antioxidants plus Vitamins A and C. Sacha Inchi Oil Contains extremely high levels of Omega 3 and 6 plus Vitamin A. Overnight Treatment Cream is a sumptuous, nourishing cream that helps stimulate surface skin cell renewal while enveloping and plumping the skin. Developed with cuddting-edge Argan stem cell technology and a proven anti-ageing active to help strengthen and intensely smooth skin. Wonder oil Argan, Shea Butter and Vitamin E combine to recharge skin with moisture. Morning after morning, skin seems to awake renewed and radiant. Directions for Use: For best results, massage gently onto clean skin in the evening.